What does Goldsplinter Woodworking, LLC offer? We design, build, and install fine, custom furniture, built-ins, cabinetry, and accessories for residential and commercial environments. Most of our custom work is centered around Asheville, NC and the southeast. But, we have sent numerous batches of custom serving pieces for restaurants in New York and Washington D.C., as well as built and shipped grand built-ins all the way to California. So, ya know, we’re open to ideas. Goldsplinter Woodworking LLC produces a range of custom work for private and commercial clients. The nature of the products can vary widely as can the process of building them. The conception and design process, however, are basically the same. In a nutshell, the process works like this…..
You have a vague idea of what you might need. We can chat over the phone to get a rough idea of the scope, possible options, and basic things to consider. Often with smaller projects, a simple sketch and detailed conversation are enough to provide you with a rough estimate. If we proceed to the next step, we can meet in person, usually in the space for which the piece is destined. In most cases, seeing the actual space is essential to get a sense of the environment and the surrounding elements that will inevitably have an effect on the design. It is generally helpful if you have at least a photo, a magazine clipping, a messy sketch, etc., that can serve as a springboard for a more refined design. 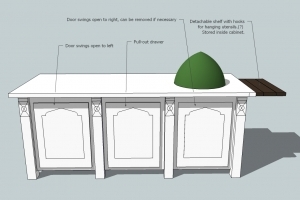 While on-site, usually things quickly take shape through brainstorming while critical measurements are taken. We can then create an actual proposal or more detailed estimate. If called for, we can make changes or rework things as needed. Of course, if you already know exactly want you want and you have a drawing ready to work from, thats great, too. If we decide to proceed, work usually begins with a 50% deposit. The remaining balance is due on installation and your approval of the piece. You are left with a piece or project that is tailored to your needs and reflects your style well beyond what the average store-bought options could provide. The quality will be superior and often the piece will be available in less time than it takes to shop for that unique something. In addition, you now have a direct relationship with the manufacturer, avoiding the many hurdles one often needs to clear to get post-purchase service from a foreign manufacturer should you need it. Repairing and refreshing an old piece of wooden furniture can be a great way to add new pieces to your collection or keep your old favorites out of the landfill. Not only can it be one of the most cost effective options for your interior, it can also be a lot of fun watching an old piece gain new life. The most common repairs are loose joints on tables and chairs, stuck or misaligned drawers, and broken or missing pieces. All of these are usually quick, straight-forward repairs that can make life a lot easier and generally run between $50-$200. It usually helps if you can get the piece to the shop for the most accurate estimate, but on-site estimates and repairs are sometimes necessary. Being a woodworking studio however, we unfortunately do not do upholstery work. If you have a project that you’re curious about, give us a call. 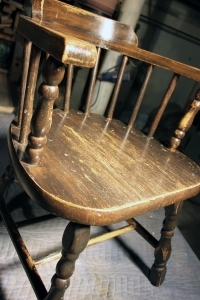 Its surprising how rewarding it can be to restore a humble, wobbly chair with arms worn smooth long ago by grandpa so that now, the grand kids can use it at the computer desk. 828.318.6334. Kenilworth Studio Tour time again….